Next season, jackets and coats will be extra large, such protective cocoon against the prevailing crisis. 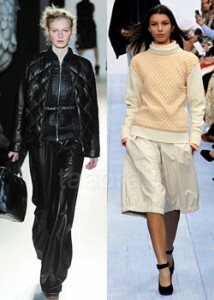 Photo: Parade Jil Sander and Chloe show. 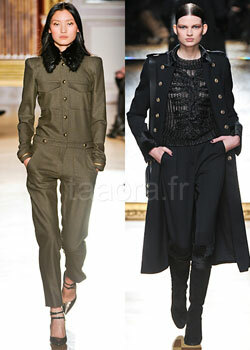 Strong trend in fashion Autumn / Winter 2012-2013: the military style, which comes up regularly on the front of the stage. Program coats army, shirts and jackets with strict two or four flap pockets, braid, gold buttons, collar officer. Photo: Barbara Bui parade and parade Salvatore Ferragamo. 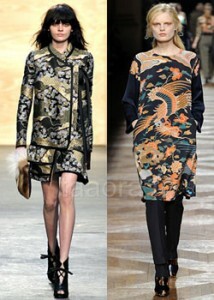 Comeback of Asian style dresses in silk, printed with lotus flowers and dragons. Photo: Proenza Schouler fashion show and parade Dries van Noten. Smooth or polished metal, the leather will be present in all forms. In choosing dresses, tops, pants skinny jeans or wide, jackets, coats. Photo: Parade parade and Barbara Bui Cacharel. Back in the Middle Ages with the chainmail (garment made of metal mesh) that transforms classic gowns in modern armor. Photo: Yves Saint Laurent fashion show and parade Paco Rabanne. Field’s flagship winter: the velvet smooth as baggy pants, dress, sweater or dress. Photo: Paul & Joe fashion show and parade Carven. 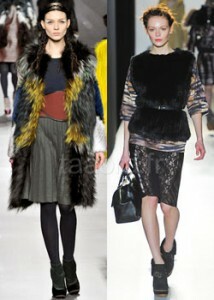 For several seasons the fur makes its comeback in the collections of designers to choose plain or colored / printed. Photo: Fendi fashion show and parade Mulberry. In addition to the Asian motifs, we also find many printed tapestry (flowers, Cashmere, regressive patterns) but also embroidered (canvas). Photo: Dolce & Gabbana fashion show and Carven. Spotted on the catwalks: clothing “jewels” embroidered with precious stones. Photo: Lanvin and Louis Vuitton. 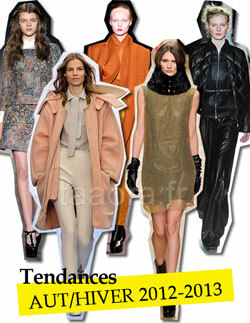 Focus on the padded clothing (jackets, tops, sweaters, skirts), a trend that definitely love to wear next winter! Photo: Parade Mulberry and Chloe show. The Autumn / Winter 2012-2013 is sure to pep, the orange color is one of the lights seen on the catwalks. Photo: Parade parade and Mulberry Haider Ackermann. Do not hesitate to invest in parts pastel colors now, the big trend of summer 2012 will always be in vogue next winter. Photo: Cacharel fashion show and parade Jil Sander. Honor to the female curves accentuated by Basque, present on jackets and dresses. Photo: Burberry show and parade Carven. As for accessories, finally, the corset belt will mark our size of its XXL size. Note some models with tails (see pattern above). Photo: Fendi fashion show and parade Haider Ackermann. Trends of summer 2012 that will always be with us for the winter of 2012-2013: the pastel colors, orange, pleated skirt or pants with two-color band on the side.